Day two of the BOOST Chennaiyin FC Football Championship was a goal-laden affair at the Doveton School Ground, Vepery, in Chennai on Wednesday. Four goals or more were scored in all but one of the five one-off knockout Under-13 ties played on day two. Chettinad Vidyashram played Kerala Vidyalayam in the day’s first game. The first hat-trick of the tournament was scored by Chettinad’s Banday as his side ran out 5-0 winners and qualified for the group stage. Chinmaya Vidyalaya, Kilpauk then won their game against Pupil Saveetha 4-2, Bhavya starring with a brace. Pupil Saveetha fought hard and got on the scoresheet through Sriman’s double, but it wasn’t enough. There were doubles scored in each of the three games that followed after too, the first of which was by Qamar in Anjuman Matriculation’s big 7-0 win over Mohammed Sathak. Apart from Qamar, Anjuman had five different scorers. 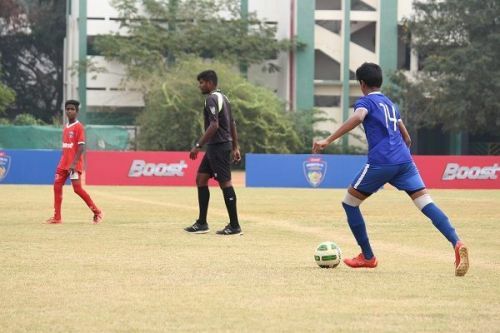 Ritesh’s brace powered Chinmaya Vidyalaya to a 4-0 win over Seetha Kingston in the day’s penultimate game. Chinmaya scored three goals in the opening six minutes to catch the opposition cold. As for the day’s last bit of action, PSBB, Siruseri got the better of P.S. Senior Secondary School 3-0 with Andrew scoring two for the former.